Personal Computer or PC are commonly composed of three devices, the monitor screen, the system unit and the keyboards and mouse. This devices are controlled by controller IC's through the processor abilities. And this connected to the system units input and output system called I/O ports. Through this connections may the cause of the problem. Either the system units, the keyboards and mouse, or the monitor screen. But the very question is, why the computer freezing the moment I power-up and during the windows operations or during once I login to the internet. Or the entire system will freeze that I cannot use to shut down or restart my system unit using my mouse and keyboards. There are two things that we need to consider here the hardware and software to run its system. So maybe the problem cause by a software or hardware. Lets talk first the cause of the freezing problem that may the cause is the hardware. Inside of your system unit or commonly called (CPU) there is hardware inside called hard disk drive, motherboard, processor, main memory or RAM, power supply unit (PSU) and the daughter boards. The common daughter boards are video cards and WiFi cards because other daughter boards are built-in now in the new form factor of the motherboards, like the LAN port. Now as what I experience in troubleshooting, the severe cause of the freezing is the overheating of the main processor and the video processor one at a time. The very cause of the problem is the dust build-up inside of the system unit. And the lower speed of the cooling system, much of all if you are using only an air block to cool the processor chips. Consider the bullets text below so that you will learn what are the main causes and tips to avoid the problem. Perform contact cleaning of the daughter boards Pins and RAM. Be sure that the cooling fan is in normal speed by lubricating it. Be sure that the heat sink and the processor chips is attached very will using a thermal paste. Check always the over temperature of the Southbridge and nortbridge IC controller. 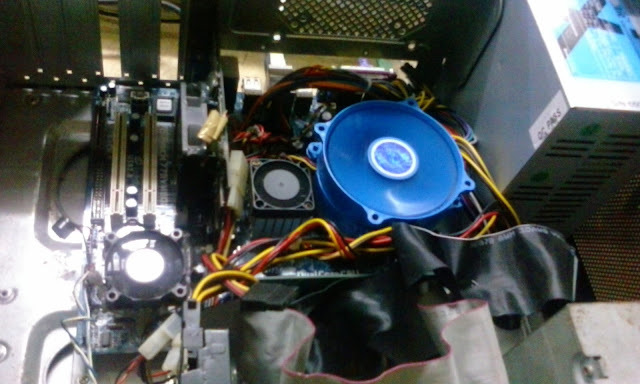 If you feel using your fingers that its overheated put a cooling fan above of the heatsink. Avoid to set overclocking of the processor to pass a system requirements of a games software or any software application. Do not install hardware or any input devices that required a high wattage. Be consult first the experts and or upgrade your power supply unit base of the power rating of your system unit. Consider to use uninterrupted power supply(UPS) to protect for surge cause by a high fluctuation rate of the source voltage. Do not stay longer in gaming most likely 8 hours, it will cause damage to the main memory. As much as bad in our health. Perform proper shutdown to stay good performance of the hard disk drive . One of the cause of the freezing might be of the damage of the hard disk drive platter. You installed software that violates the system requirements that your hardwares not meet the system requirements. Do not install many softwares and utilities, it will cause low performance of the processor speed and hard disk drive. Be sure that you have always updated your virus scanner, without virus scanner this will cause damage of files and registry of your operating system. Because we expect always that our files came from USB drives and internet probably have a viruses. Remove unnecessary programs and files stored in HDD. Be sure that has a backup drive or drive d: this will be the backup storage of your important files. Avoid to save always in my documents, be sure to delete unnecessary files here. Copy and paste it in backup drive. Avoid the hard disk drive c: will become full, if ever perform a disk cleanup. Freezing error is like also a hang-up, this problem could be avoided by means of following the tips and reason I mention above. But because this problem is needs a technical skills. This is also difficult to the user who don't have a skill to diagnose and repair. Your ample experience also needs or required in order to dismantle the computer system unit. To prepare your self for this kind of problem you must also to learn about technical skills.